We have recently added a number of small crosses which are ideal gifts for children. 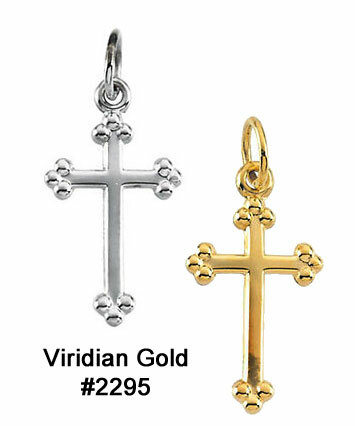 These crosses include a 16" yellow-gold-filled chain at no charge. Options are offered for 14K gold, 14" chains, as well as other lengths, and these can be selected when you order the cross. For instance, at left our Child's Budded Cross Necklace is available in 14K yellow or white gold and is 9/16" tall -- is perfect for a baptism gift. 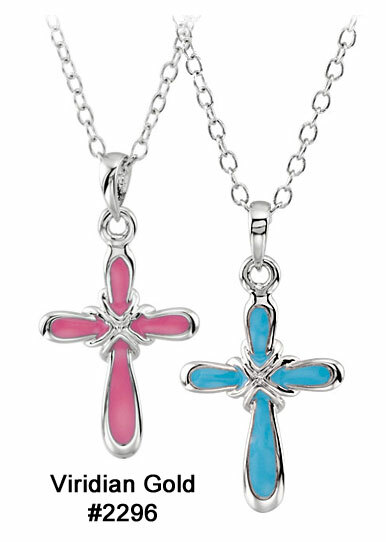 A colorful alternative is our Child's Dedication Cross, at right, which is made of sterling silver, with a blue or pink enamel interior. It includes a 14" sterling silver chain, too. See our Children's Religious Jewelry page for a huge selection of cross pendants and necklaces, as well as earrings, in both sterling silver and 14K gold.